Downtown Columbus, Ohio, is facing a parking crunch. But parking prices aren’t high enough in this city to make garage construction a viable private investment. Faced with this situation, a lot of cities would pour a bunch of money into a big subsidized garage or two. But in Columbus, several officials have hit on a smarter idea: providing free transit passes to downtown workers. The city is currently running a pilot transit pass program for a few hundred downtown workers. If it’s successful, the program could be expanded to cover the entire downtown and relieve the pressure to build garages. Let’s ask how we can encourage people who are looking to shed the baggage of their personal car. It’s the smart and open solution. To encourage and support public transit riders is far cheaper than investing in a parking space, which cost $30,000 – $60,000 a piece to build. Moving a small percentage of downtown drivers to transit riders frees up space for those with a personal car. Let’s support more people to open up more parking space. Let’s sustain the momentum behind our downtown renaissance, and use pro-active problem solving to get more people into downtown in a way that does not resort to building more expensive and inefficient parking infrastructure. The Transit Pass premise is simple. It sets up a plan to financially support more of our downtown workers taking public transit into downtown. Those workers leave their cars at home. It leaves more room for others. This program has the potential to free up at least 2,800 parking spaces, or the equivalent of four parking garages. We can spend $2 million on more people riding transit or we can spend $100 million on 2,800 parking spaces. The math makes the choice simple. But let’s do it because we believe people downtown are important. Let’s do it because we want more people in our urban core. The estimates Transit Columbus provides for parking construction costs seem high to us. Todd Litman of the Victoria Transportation Institute reports that in nearby Cleveland, a structured parking space cost about $15,000 to build [PDF] in 2009. But when you consider other costs — like the $500-$800 to operate and maintain each space per year, or the opportunity cost of using downtown land for car storage instead of offices or housing — the premise holds up. Paying for transit passes is a much better deal than paying for garages — and it will make your city a better place to boot. Elsewhere on the Network today: The Bicycle Coalition of Greater Philadelphia reports that PennDOT is taking some exciting steps to make room for bikes on state roads in suburban areas. Bike Walk KC says Kansas City needs a policy to prevent pedestrians from having to walk in traffic during sidewalk closures. And Stockton City Limits investigates the claim that downtown has a parking shortage (spoiler: there are plenty of unoccupied parking spaces). 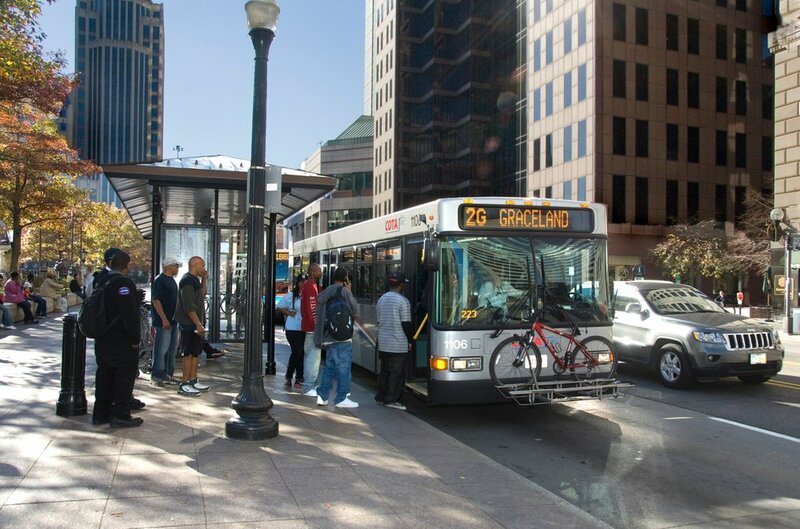 For the last year and a half, Columbus's Capital Crossroads Special Improvement District has been piloting a free transit pass program for 844 downtown workers. The share of workers in the program who commute via transit increased from 6 percent to 12 percent, and now it might be expanded to all 40,000 workers downtown. Drivers who shift to transit, biking or carpooling will earn points that can be cashed out at local businesses.